Grand Casino Video Slot Review - Casino Answers! 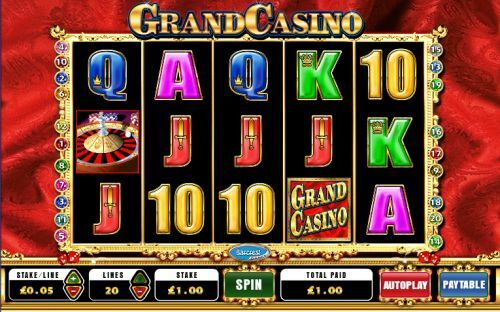 Grand Casino is a 5-reel, 20-line video slot developed by WagerWorks, featuring a wild symbol, a free spins feature and a bonus game. You can play the Grand Casino video slot at Bovada. The Grand Casino game is a penny slot. Bets on the Grand Casino slot machine are $0.01, $0.02, $0.05, $0.10, $0.20, $0.50, $1, $2, $3, $4, $5, $10, $15, $20 and $25 per line. You can select up to 20 paylines per spin for a maximum total bet of $500 per spin. The Grand Casino online slot machine has an excellent betting range that will suit the needs of any casual player all the way up to the high rollers. You can play the Grand Casino video slot by selecting your bet and pressing the “Spin” button. The top-paying symbol on the Grand Casino video slot is the Wild symbol. By landing 5 of a Kind of the Wild symbol, you will win the 10,000 coin top jackpot. The Wild symbol will substitute for all symbols except for the Roulette and Dice scatter symbols. Three Dice symbols on any position on reels 2, 3 and 4 will win you 10 free spins at a 2X multiplier. All winnings from the free spins feature are doubled. 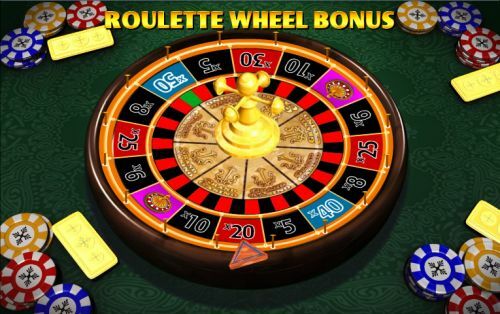 Free spins are played automatically and at the same lines and bet per line as the initiating game. Free spins use the same payouts as paid spins. Additional free spins can be intiated during the feature. Additional free spins will be adding to the running count of free spins. The free spins feature will end when no more free spins remain or after 999 free spins have been played. Win free cash from the Grand Casino slot game at Bovada! All awards shown are per winning line. All payline symbols must appear on a played line and on consecutive reels, beginning with the far left reel. Only the highest win is paid on each line played. Scatter wins are awarded for symbols appearing on any position on the reels for any number of played lines. Scatter wins are paid in addition to line and bonus wins. Malfunction voids all pays and plays. Grand Casino has a simple autoplay mode. Press the “Autoplay” button to select 5, 10, 15, 20 and 25 autoplay spins. You can stop the autoplay mode on the Grand Casino online slot at any time by hitting the “Stop Autoplay” button. The Grand Casino video slot from WagerWorks and Barcrest Games has a free spins feature and bonus game to offer along with its 10,000 coin top payout. You can play the Grand Casino video slot without downloading any casino software today at Bovada! Can USA players play the Grand Casino slot game for real money? No, currently American players cannot play the Grand Casino video slot from WagerWorks at this time. Instead, we suggest that you read our Crazy Vegas Video Slot Review and play it at the USA-friendly Bovada. Do I need to download any casino software to play the Grand Casino video slot? No, the Grand Casino flash game is played exclusively in your web browser at Bovada. You can play for free or real money. If you have any issues playing the flash casino, make sure you have the current version of Adobe Flash Player.